SUSTAINABLE FORESTRY in Maine is attracting interest well beyond people who grow and harvest trees. One indication is the large gathering of performance builders and architects at the Maine Wood & Sustainability Conference in Portland in May. Another is the wide variety of new purposes for forestry. Good forest management has long been essential to maintaining Maine’s reputation for clean water, whether for public drinking supplies or healthy fish populations. Today's forestry is being used as a tool to moderate the decline of songbird populations and the buildup of carbon dioxide in the atmosphere—and to support eco-tourism development. What exactly does sustainable forestry look like? It’s not always obvious, even to the trained eye. There are many facets: some are visible and others can only be measured with detailed audits that can answer some big questions. Is this section of forest growing faster than it is being harvested? Is there an appropriate mix of tree ages? Are ecological values being protected? Are local communities benefiting? This article attempts to illuminate sustainable forestry by highlighting several key components. The following five profiles highlight landowners who practice forestry with a long-term view and a bedrock principle of sustainability. Each landowner is passionate about a different aspect of sustainable forestry: wildlife habitat development, carbon storage, water purification, outdoor recreation and high-quality timber. Together, these stories form a composite picture of "sustainable forestry." Deer hunters have gotten lost in this patchwork of wetlands, recovering clearcuts and young forest. It’s a rough place. Sapling thickets close down views along the narrow logging roads. The random open areas are choked with waist-high brush and piles of slash. Walking is difficult. “It’s not pretty,” said Kurt Woltersdorf, the architect of the recovery effort in Sanford that is still decades away from completion. He’s standing in a brushy area opened up by a heavy-duty mowing machine three years earlier. “Mess is good. I would have liked these piles higher. But small animals can still hide in there,” he said. Woltersdorf, a deer hunter, is intentionally creating “mess”—or forest structure—to attract wildlife of all kinds. It’s already working. On a short midday walk, we spotted deer tracks, a turtle nest, an active beaver pond and several eastern towee sparrows. Wolterdorf related encounters with a barred owl family, an otter, coyotes and bobcats. Encouraging wildlife is both a personal preference and the only real management option. The woods they bought in 1999 had been heavily logged over. They had no choice but to wait for trees to grow back. Left alone, clear-cuts grow back into dense thickets, then crowded stands of same-aged, slow growing trees that some wildlife species can’t use. A forest with trees of diverse ages and species provides a better suite of habitats. Woltersdorf got a start with help from a federal program that funds the creation of young, dense forests for the rare New England Cottontail rabbit. It may sound counter-intuitive to clear new openings in areas clear-cut 25 years earlier. But not all cutting is destructive. The new patches, planned by a forester and implemented by a skilled logger, are small—a quarter acre to a few acres—and strategically placed to introduce age diversity. He’s still waiting to see rabbits. Wotersdorf’s ultimate goal is growing large pine trees, but he’ll maintain some openings as the forest grows up and hopes to see some rabbits. HISTORY AND CHARACTER: Flat, sometimes boggy, woodlands recovering from clearcutting 35 years ago. GOVERNMENT INCENTIVES: Owners received funding from a federal program to create 18 acres of habitat for New England Cottontail rabbit. They are not participating in current use property tax reduction programs. COMMERCIAL PRODUCTS: Pine saw logs after several more decades of growth. PRIORITY LANDOWNER GOAL: Wildlife habitat development. A worn tote road leaves a field, climbs through open glades, past a remnant stone wall, and climbs higher into darker woods. These woods are inviting. Perhaps it’s because they have been thinned, using horses, for the past 30 years. Perhaps it’s because Peter Hagerty, a professed romantic, speaks so passionately about using throwback technology to advance forward-thinking forestry. His passion is developing guidelines for thinning that maximize the storage of carbon. Hagerty has temporarily stopped logging his own woodlot. He won’t start again until he and other members of the low-impact forestry group at Maine Organic Farmers and Gardeners Association (MOFGA) develop the guidelines for managing forests as a counterweight to the destabilizing build-up of carbon in the atmosphere. “Scientists have told us basically we’ve got only a short period of time to turn it around. Maybe 18 to 28 years. Our biggest ally is the forest. Nothing else comes close to capturing as much carbon,” he said. Markets for carbon credits already exist—a way for woodland owners to earn income by improving forest carbon storage (essentially by slowing down logging intensity). The process currently makes financial sense only for landowners with thousands of acres and long time horizons. The minimum economical acreage is considered to be about 2,000 acres, depending on forest type, stand volume and market conditions. Hagerty is optimistic that markets will develop for smaller landowners, and he’s adamant that restrictions allow silviculture, including logging for wood. “The last thing I want to do is put people out of work. We have to manage carbon and at the same time provide work,” he said. In the meantime, Hagerty teaches landowners how to calculate their own woodlot’s carbon storage through the Low Impact Forestry Group of MOFGA. Demonstrating, he uses a plastic protractor to estimate the height of a tree and a tape measure to measure the circumference. He then looks up the stored carbon in each tree, by size and species. He estimates carbon storage over a large area by extrapolating from measurements in a sample plot. His tools—“basically a back to school kit from Walmart”—are a simple alternative to pricier forest measurement tools. “The forest is one of the tools we can work with, so our great grandchildren can survive,” he said. HISTORY AND CHARACTER: Steep woodlot that has been logged at low intensity for 30 years with a pair of draft horses. GOVERNMENT INCENTIVES: None. Owners decline to participate in current use property tax reduction program or federal cost-share programs. PRIORITY LANDOWNER GOAL: Absorbing atmospheric carbon to mitigate climate change. Mountain biking and timber harvesting go hand in hand in Carrabassett Valley. Photo courtesy of the Carrabassett Region New England Mountain Biking Association. Tens of thousands of people a year visit the woods below Sugarloaf Mountain to ride mountain bikes, cross-country ski and tramp around on snowshoes. The lacework of recreational trails is intertwined with a network of logging trails. Traditional timber harvesting and outdoor recreation have developed in symbiosis in Carrabasset Valley since the town incorporated nearly a half century ago. At first it was cross-country skiing and routine logging on the lower slopes of Sugarloaf Mountain. Then, by degrees, the town moved into summer outdoor recreation. A mountain bike trail network was developed that connected to a narrow-gauge railroad bed, the Appalachian Trail and the Maine Huts and Trails network. Silviculture in this case supports trail development. For example, the town recently spent $150,000 in timber sale revenue to replace 55 bridges in the trail network. “You’ll never see a resort community more joined at the hip with outdoor recreation,” said Cota. HISTORY AND CHARACTER: The town inherited a legacy public lot when it incorporated in 1972 and later acquired additional acreage from the state. The woodlot sits on the lower flanks of Sugarloaf Mountain and contains cedar bogs, mixed hardwood stands and spruce stands on higher elevations. There are several “high value” sites, according to Matt Jacobs, forester for American Forest Management. GOVERNMENT INCENTIVES: Because it is owned by the town, the property is untaxed. The town uses some of the timber sale revenue to replace recreational trail bridges. WOOD PRODUCTS: White birch used for making drumsticks and golf tees, hardwood veneer for furniture, pulpwood, biomass. “The whole gamut,” said Jacobs. PRIORITY LANDOWNER GOAL: Trail development for snowshoeing, mountain biking and cross-country skiing. Some 35 miles of trails at The Sugarloaf Outdoor Center connect to a larger network. Bob Chadbourne hosts a recent delegation of foresters who came to admire his very large pine trees. Photo: Brian Roth. Bob Chadbourne doesn’t claim to have the best pine trees in New England, but the way he keeps winning awards and hosting tours of visiting admirers seems to suggest he’s right up there. The most recent tour in July 2018 organized by the Society of American Foresters drew 40 people. HISTORY AND CHARACTER: The lands have been in family ownership since the 19th century. Management became more systematic when the family began operating a small sawmill in Bethel in the 1930s. When biomass markets were strong, several small machines were used to thin out low quality hardwoods from pine stands. GOVERNMENT INCENTIVES: Landowners have their lands enrolled in the Tree Growth property tax incentive program. Landowners have utilized federal cost-share programs to plant seedlings and other management techniques. WOOD PRODUCTS: The typical array, which includes biomass, pulp, firewood, pallet logs and saw timber. 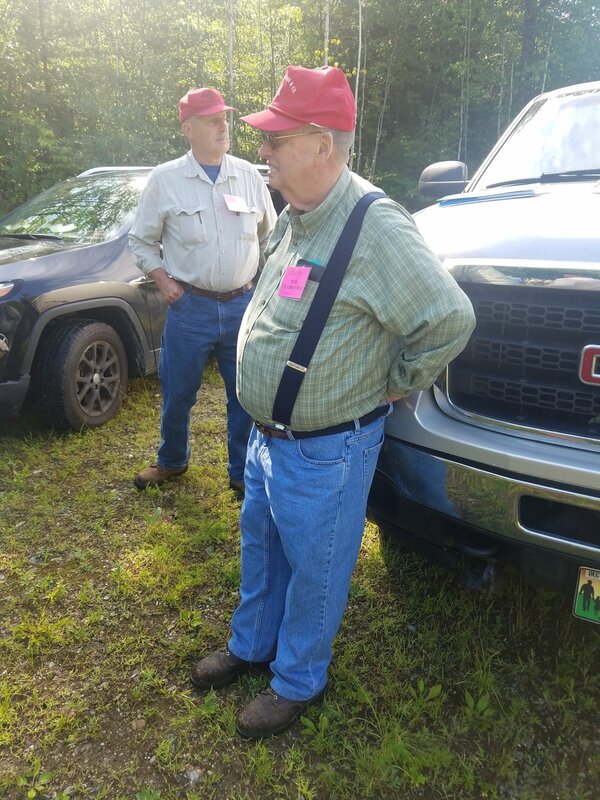 PRIORITY LANDOWNER GOAL: Growing high quality large-diameter white pine saw logs SATISFACTION: “Maybe growing big pine trees is in the family DNA,” says Bob Chadbourne. Logging generates income for the district to keep water rates low and avoid impacting property taxes. HISTORY AND CHARACTER: Auburn and Lewiston began drawing drinking water from Lake Auburn in the late 19th century. Swimming in the lake was banned in 1880. Forest management began with tree planting in open fields in the 1930s. Forest management became professionalized with involvement of the Maine Forest Service and, eventually, consulting foresters. Logging in the 3-square-mile watershed is regulated. GOVERNMENT INCENTIVES: Because it is publicly owned, the property is untaxed. WOOD PRODUCTS: Typical range of wood products including saw logs, pulp wood, pallet logs. PRIORITY LANDOWNER GOAL: Avoiding construction of a water filtration plant for Lake Auburn, the water supply for about 80,000 people in the Lewiston-Auburn area. SATISFACTION: “We’re kind of spoiled,” said Sid Hazelton, superintendent of the Auburn Water/Sewer District, proud of the district’s history of clean water and the role of forest management in the 15-square mile watershed surrounding the lake. 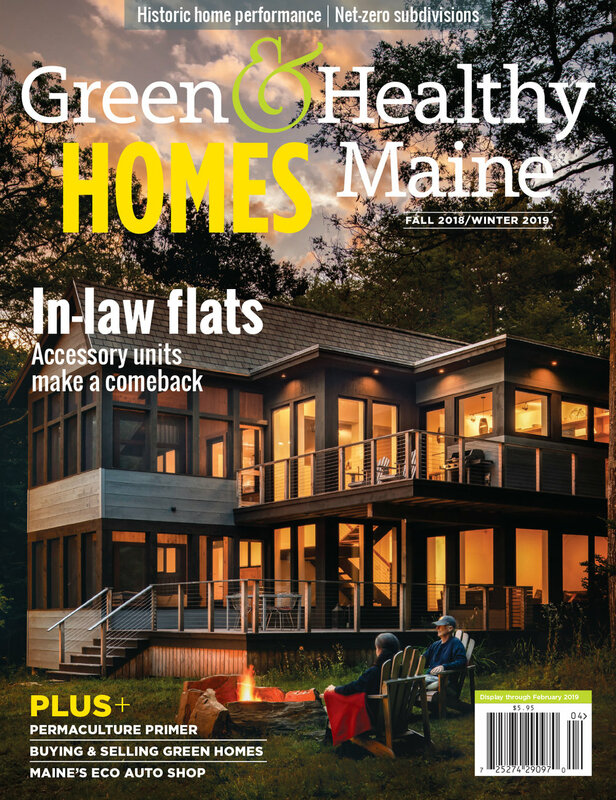 This article was re-printed from the fall/winter 2018 issue of Green & Healthy Maine HOMES. Subscribe today!